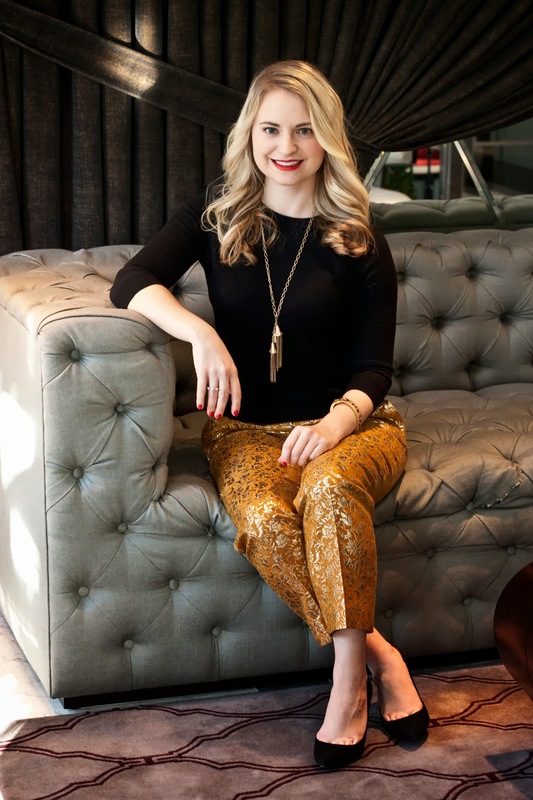 Megan at her Bar Cart in Washington D.C.
Megan: If you're headed to a glitzy, swingin' New Year's Eve party like the kind Harry & Sally were always meeting at (then I envy you because those parties looked awesome), the occasion calls for a festive, sparkly party dress. I love this J.Crew number because it has some of my favorite elements: a neckline I won't be tugging at all night long, a metallic fabric, and a full skirt for twirling. Ann Taylor (yes, Ann Taylor!) has been rolling out one pair of good-looking shoes after another this season, and these darling bow pumps will turn heads as you're coming and going. To pick up the bow theme of the shoes, I've added this J.Crew holiday bow necklace and Kate Spade bow watch. Bows on bows on bows on toes! Megan: Sometimes the best New Year's Eve celebrations consist of nothing more than a few friends, a cocktail or two, and round of Auld Lang Syne. If you're planning to ring in the New Year with a cozy night at home, I love the idea of a "fancy pant"- it's celebratory without much more effort than jeans. I've paired these gold brocade pants with a black merino sweater and a classic black pump. I love a good tassel necklace, and I've been collecting them since I was old enough to drive to flea markets on Saturday mornings. I love the art deco feel of this J.Crew necklace that I got last year, but tassels have been turning up everywhere this season, and this is one of the hardest working pieces in my jewelry box. New Year's Eve style doesn't get much easier than this. Megan: There's so much anticipation around New Year's Eve that sometimes New Year's Day feels like a bit of a let down, and that's no way to begin the year. 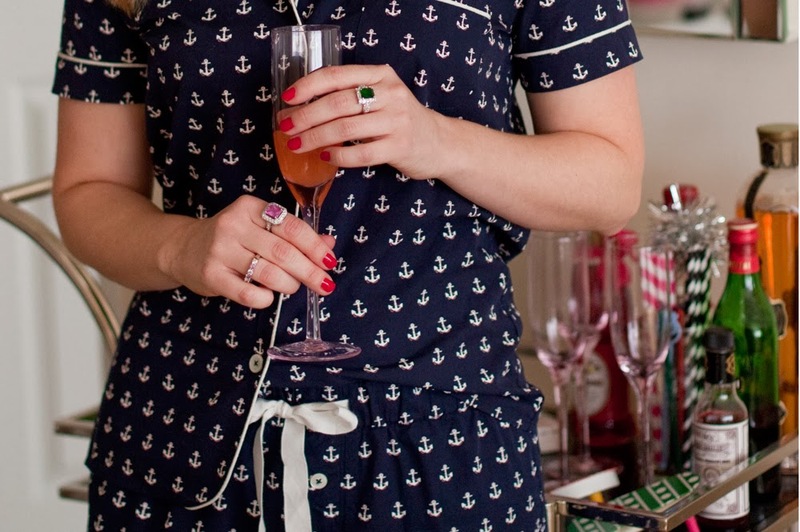 So what better way to celebrate than with a pajama party brunch? If you've had perhaps a bit too much to imbibe, then this hangover chic get-up is just the ticket. I call these J.Crew pajamas my party jams, as I've worn them to more than one party but have yet to actually sleep in them... I've found that the trick to styling glam jams like actual clothing is lots of statement jewelry and real shoes. I've layered on the pearls and stacked up the cocktail rings and found these glitter smoking slippers at Gap. 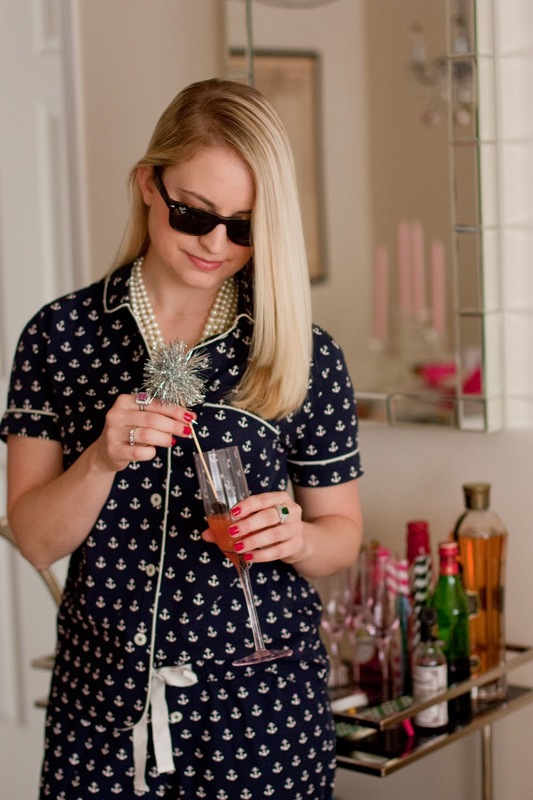 Put on the sunnies, pop the bubbly, and raise a (wobbly) glass to 2014. 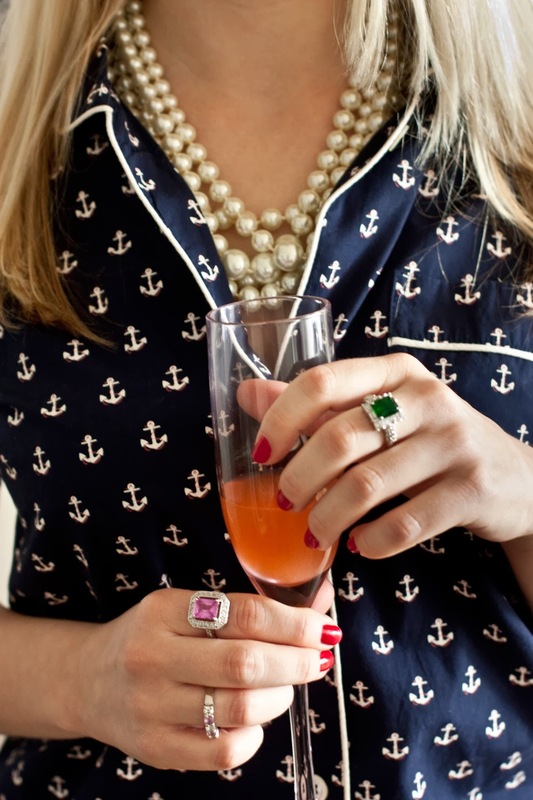 Doesn't this make you think you should always wear pearls with your pajamas? And lucky us - Megan has already agreed to return in January with some looks for Valentine's Day. Thanks, Megan!